Until 1885, only the most intrepid explorers ventured into the Okanagan Valley. In that year, the situation west of the Rockies changed irrevocably with the completion of the Canadian Pacific Railway. A subsequent spur line to Okanagan Landing in 1892 and the launch in 1893 of the SS Aberdeen opened up the Okanagan Valley to settlers. Several communities, including Peachland, Summerland, Penticton, and Naramata, were founded soon after. By 1898, Peachland had its first schoolhouse, which still stands, and its first post office. 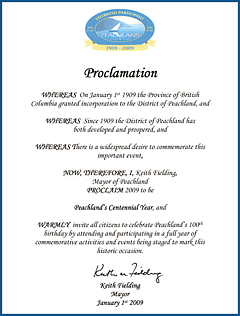 On January 1st, 1909, Peachland, with its population of about 200, was officially incorporated as a District. 100 years of Council Meeting Minutes were compiled by District staff who selected the most interesting, quaint, quirky, historical snippets of life in Peachland, and included records detailing confrontations, rasicm, war efforts, the beginning of electricity, times of drought, and storage of water. 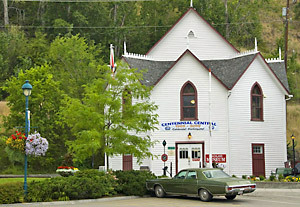 In 2009, the District of Peachland, now with a population approaching 5,000, celebrated the Centenary of its Incorporation. The motto of the Centennial was Celebrate and Participate.